Skull and head should be of good size. Skull: Skull high in dome, good length and width allowing for large brain capacity. Top-knot should consist of long loose curls growing down into a well defined peak between the eyes and should not be in the form of a wig, i.e. growing straight across. Face: perfectly smooth. Hair grows in a narrow line forming a beard at the back of the lower jaw. Teeth: Strong and regular with scissors bite. Eyes: Comparatively small almond-shaped, dark amber or dark hazel and very intelligent looking. Ears: Very long and lobe-shaped in the leather, set low, hanging quite close to the cheeks and covered with long, twisted curls of hair. The gait has a characteristic peculiar to the breed, that of a rolling motion produced by the barrel-shaped ribcage. Fairly long, strong and arching, (enabling the head to be carried well above the level of the back) and strongly set into the shoulders. Should be of good size, being as a whole so proportionate as to give a barrel-shaped appearance accentuated by the springing of the ribs, overall strong and well- muscled. Back: Short, broad and level, strongly coupled to the hindquarters. Loins : Deep and wide. Chest: Deep, but not too wide or round between the forelegs, though large girth with ribs well sprung behind the shoulders. Ribs carried well back. Smooth, strong and thick at root (where it is covered for 3 to 4 inches – 7.5cm to 10cm with short curls), and gradually tapering, ending in a fine point. It should not be long enough to reach the hock joint, and should be carried nearly level with the back in a straight line. HAIR : Dense, tight, crisp ringlets, entirely free from woolliness but with a natural oiliness. The back and sides of the neck should be covered with curls similar to those on the body, the throat should be smooth, the smooth hair forming a V-shaped patch from the back of the lower jaw to the breastbone. The forelegs covered with feather, which should be abundant all round though shorter in front. Below the hocks, the hindlegs must be smooth in front, but feathered behind down to the feet. COLOUR : A very rich puce liver, white on chest objectionable. Section 3: Water Dogs. With working trial. Smart, upstanding, strongly built, compact or cobby. Proud, combining great intelligence and endurance with a bold and dashing eagerness of temperament, immense stamina and loyalty. A good family dog with a sense of humour but discerning with strangers. Shoulders: Very powerful and sloping. Forelegs: Well boned and straight, the forearm at point of elbow in a straight line with the highest point of the shoulder blade. Large, somewhat round and spreading, well covered with hair, both over and between the toes, but free from any superfluous feather. The exact origins of the breed remain obscure. 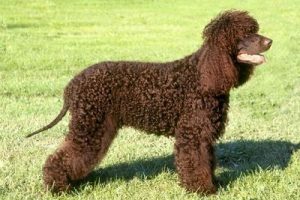 Generally it is thought that Water Spaniels evolved from dogs that originated in Persia and came to Ireland via Spain. The first Irish reference to “ water dogs t hat pursue water fowl” dates from 1600, so we know that dogs with wa terproof coats were used in Ireland even before the advent of the fowling piece. There is no real evidence of the ancestry of the Irish Water Spaniel except in its most peculiar feature-the rat tail. 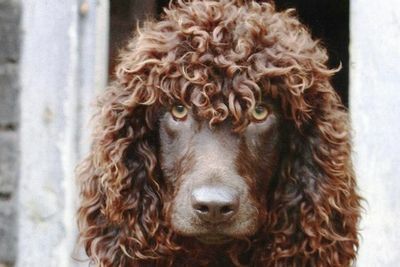 This feature appears in no similar dog and makes it very likely that the modern breed had an indigenous Irish ancestor. The tail has given rise to the names “ Whip Tail” and “ Rat Tail”. 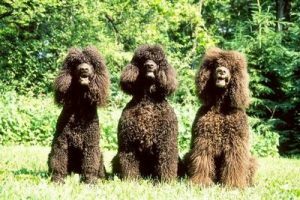 In any event the desce ndants of these dogs were accepted and achieved great success on show benches in the second half of the 19th century. In 1890 the Irish Water Spaniel Club was formed to promote the interests of the breed.